In this month's Catholic Digest, I read an article about making a spiritual pilgrimage. The idea is that if you are unable to actually travel for a pilgrimage, you can do it spiritually from where you are. With the Lourdes apparition celebrating 150 years this year, I thought a pilgrimage to Lourdes would be interesting. I used this site to calculate the distance, and found that it is 5,634 miles between my city and the city of Lourdes. I have decided to say one Hail Mary for each mile, and hope to complete my pilgrimage in a year. That means saying 14-16 Hail Mary's a day for the next year. 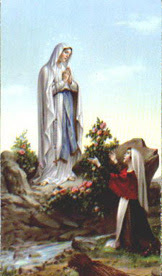 I think I'll take off on February 11 -- which is the memorial day for Our Lady of Lourdes. I'll also take time to read more about Bernadette and her sightings, the miracles attributed and the area. If anyone would like to join me, please let me know!